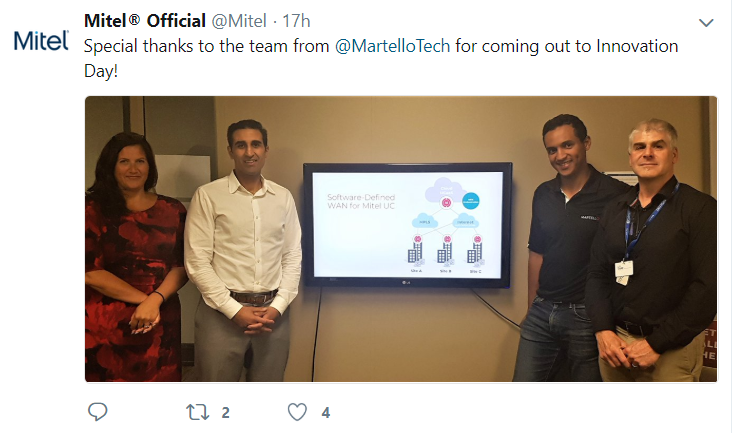 This week, Mitel hosted their 8th Annual Mitel Innovation Day. At Martello, it is always an exciting day to be a part of with lots of energy and BIG ideas being showcased. From the opening Keynote to the amazing presentations to the high energy awards ceremony at the end – it was another great day to be at Mitel. In conversation during our sessions it was clear that Mitel strives for better customer experiences – and providing reliable network performance is key to making that happen. A network monitored with Mitel Performance Analytics (MPA) delivers better network performance for business success. We know that the move to the cloud is changing everything. During our session we talked about how with MPA you can manage your entire network with a deep focus on Mitel voice quality – easily identify small problems before they grow. When it comes to building an agile and resilient network structure, SD-WAN technology makes managing and optimizing competing network traffic simple and cost effective. Did you join us and have any follow up questions? Don’t hesitate to contact us or pop by the Martello office – we would be happy to talk!